Pilots can learn important lessons from a recent accident that claimed the lives of several "Instagram stars." Subscribe today to Plane & Pilot magazine for industry news, reviews and much more delivered straight to you! Any loss of life in an aviation accident is tragic, but it seems even more so when those we lose have a lot of life in front of them. By now, everyone in aviation has surely heard about the horrible crash in Scottsdale, Arizona, in March in which six young people lost their lives. Several of the occupants have been described in the tabloids as “Instagram stars.” Instagram, for those not familiar with it, is one of the most popular social media apps in the world. Users create a profile and then post photos or short videos of themselves, often living the good life. Instagram users are overwhelmingly young people. And an Instagram star is a kind of star, but only within the Instagram universe. Some of them have tens of thousands of followers, even though they’re famous for no other reason. The mission was to fly from Scottsdale to Las Vegas, a roughly two-hour-long trip over high and inhospitable terrain, reportedly to attend a social event. The flight instead lasted a minute or two. The details are still emerging, including who was at the controls at the time of the crash. There were two pilots aboard, including Erik Valente, a 32-year old ATP with thousands of hours of flight experience, including in jets. The airplane’s owner or part owner, a 28-year-old new pilot, was also in the plane, though investigators as of press time have not yet said who was flying it, if they know. They can usually tell fairly early on who was flying a plane at the time of the crash through the nature of the injuries. A 1970 Comanche 260. Photo courtesy of Wikipedia Commons. 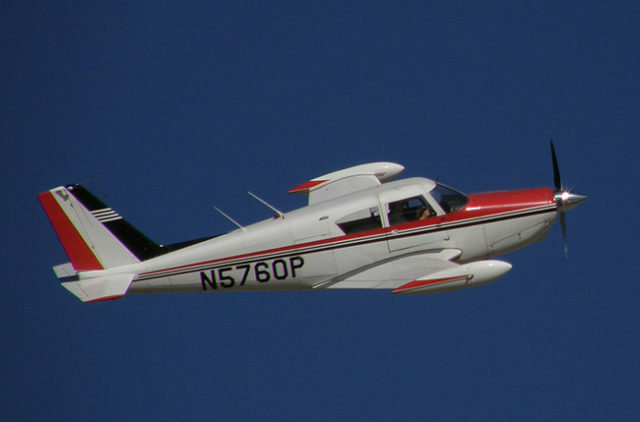 The accident airplane is listed as a 1970 Comanche 260 with a 310-hp turbocharged Lycoming engine. The additional power is not an issue. Comanches were produced with engines turning out as much as 400 hp. Some Comanches came with an option to outfit them with two small, additional seats in back, bringing the seating capacity to six. This airplane, which crashed with six adults onboard, was hopefully outfitted with these seats. The rearmost seating area is small but still takes up the full size of the baggage compartment and is placarded as having a max occupancy weight of 250. All six occupants were adults, but video posted on social media of the occupants before the flight took off suggests that none of the occupants were particularly heavy. Quite the opposite, in fact. They all looked slim and fit. There are reports that there were bags aboard, too, though where they put them and how much they weighed is just speculation at this point. Suffice it to say, however, that it is legitimate to suspect that the airplane might have been at or above its max takeoff weight and that the center of gravity was toward or beyond its rear limits. Still, with six 160-pound-on-average people, you’re still talking almost a thousand pounds of people aboard a plane that has a typical useful load of around 1300 lbs. With these assumptions, the plane could still have carried around 55 gallons of fuel, enough in a Comanche for about three hours at economy cruise speed, which is probably enough for the flight between Scottsdale and Vegas, with reserves. Inarguably tight but very possibly legal—you need just 45 minutes reserve for a night VFR flight, taking into account the wind and weather, something I am not doing here. I’m assuming the wind was not a factor in the planning. Again, I’m making the most charitable assumptions about this flight. The NTSB has not yet issued a preliminary report. When it does, we’ll know a lot more about what happened and what investigators suspect might be the cause of the tragedy. The takeoff from Scottsdale was done at night. The crash happened about 15 minutes after takeoff, according to reports from the local media. Other reports indicate the plane’s takeoff drew the attention of the tower controller, who queried the pilot about whether everything was okay with the flight. The inscrutable reply was that everything was fine and they that were on a training flight, something that was certainly not the case. The plane crashed just after takeoff, and its crash signature was that of a plane out of control, perhaps in a spin or a tight spiral, both of which can happen to planes loaded aft of their center of gravity or when maneuvering to avoid terrain when they’re low, slow and out of any good options. The plane was loaded near to or beyond its weight and balance limits. A plane loaded aft of its rear limit can be difficult or impossible to control, and pilots who have never flown a plane with a far aft CG don’t know what they don’t know, and by the time they do, it can be too late to save the day. The destination was a social event. There was likely pressure to make this trip. Passengers had already uploaded social media posts expressing their excitement about the flight. The flight was flown with just enough fuel for the flight with reserves…or less. The alternative is that it had more than minimum fuel with reserves for the trip, which almost certainly would have put it over weight. The flight was to be at altitude, likely between 10,500 and 12,500 feet (heading to the northwest). Flying high in an unpressurized airplane has risk factors associated with it as well. Especially at night. It has already been a long day. The pilot had already flown to Scottsdale from North Las Vegas just prior to the flight. Was fatigue a factor? It was night. Night flight is just riskier than daytime flying for a variety of reasons. We should all ask what we would have done in this instance. There were just so many risk factors, some of them very high risk, and others not so much. But taken together, they paint a picture of a flight that was at risk even before the engine started. We need to ask ourselves, what would we have done? Would we have admitted these factors and then done something to counteract them, like go with fewer people? Or, better yet, would we have scrubbed the mission altogether, even given the probable unspoken social pressure to get to Las Vegas? None of this is to say that there wasn’t a mechanical problem with the plane, though there’s nothing in the evidence so far to indicate that there were any mechanical issues. Even if that winds up being the case, this flight departed under circumstances that made me sit and up take notice from the minute I read about it. Regardless of what happened, and we don’t know at this point, this accident is a reminder that we need to stay vigilant and be ever aware that flying is, by its nature, a risky activity, and so we need to keep ever mindful of every risk factor we can put our finger on, even if no single one of them is enough to prompt us to call off a flight. Because more often than not, risk factors travel in groups, as they did with this tragically short flight. What kind of modification took the engine from 260 HP to 310 HP? I have been flying Comanches for 24 years and I know of no such legal modification to the 6 cylinder Lycoming engine certified for the Comanche that would give it 50 additional horsepower. The turbo feature just maintains the 260 hp rating at higher than sea-level altitudes. The Comanche 400 has an altogether different 8 cylinder engine.